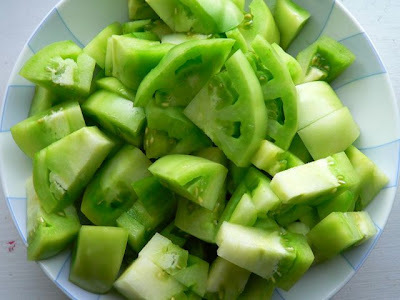 Chop the green tomatoes into bite size chunks. 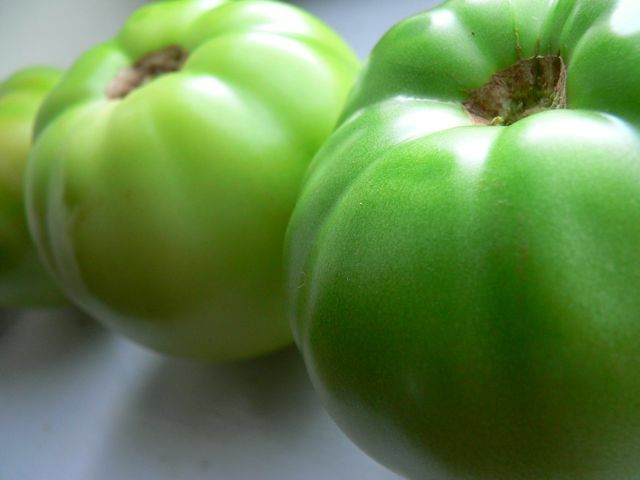 In a medium saucepan, cook the tomato with 1/3 cup sugar and lemon juice over medium heat, stirring occasionally, for about 30 minutes until it reaches a jam-like consistency. Press the tomato mixture through a sieve to remove pulp and seeds. Chill in the refrigerator. In a medium saucepan, combine milk, cream, 1/2 cup sugar, and salt over medium heat, stirring occasionally. In a separate bowl, whip the egg yolks and set them aside. Just before the milk and cream reaches a simmer, gradually add about half of the mixture to the egg yolks, stirring continuously. Gradually pour the egg mixture back into the saucepan. Continue to stir until the liquid forms a thick custard that coats the back of a spoon. Remove from heat. 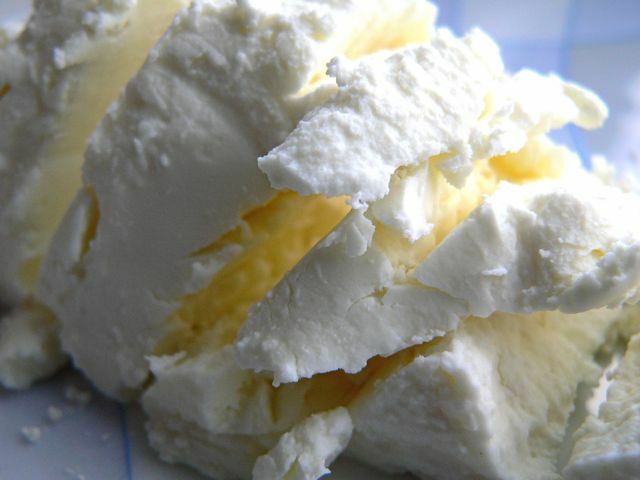 Crumble the goat cheese at the bottom of a large bowl and pour the hot custard over it. Stir until the cream cheese has melted. It may help to use an electric hand mixer to blend it together. Cool the custard in the refrigerator or using an ice bath. 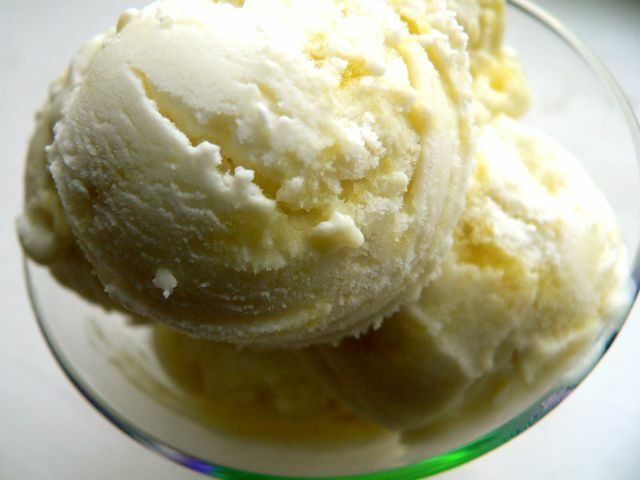 Once it's cold, whip the custard to incorporate some air—this will improve the ice cream texture. Pour the custard into the ice cream maker and freeze according to manufacturer's directions. 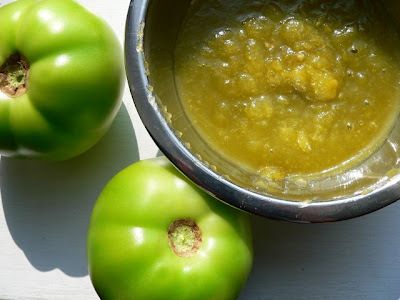 When it has reached the desired consistency, pour the cool green tomato jelly into the ice cream maker in a steady stream and churn for a few more seconds to create a swirl. When transferring the ice cream into a container, try not to mash it up too much in order to retain the marbling effect. 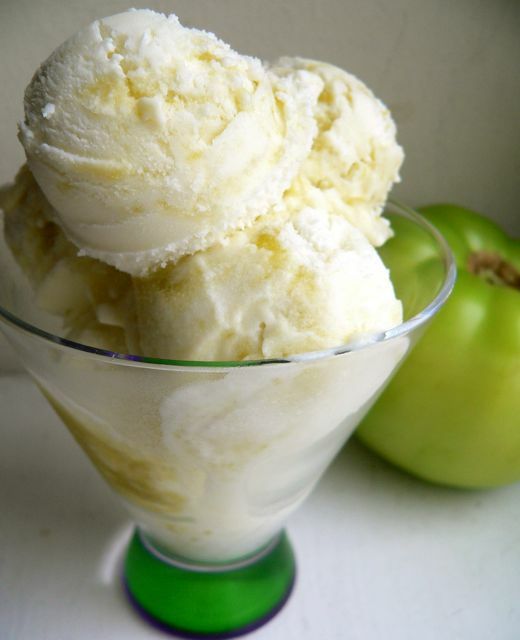 Never would have thought to use Green Tomatoes in Ice Cream. so 1/3 C sugar is for the tomato jelly? and 1/2 c sugar is for the ice cream batter?